Researchers at the National Institute of Standards and Technology (NIST) and the University of Michigan have demonstrated a technique based on the quantum properties of atoms that directly links measurements of electric field strength to the International System of Units (SI). The new method could improve the sensitivity, precision and ease of tests and calibrations of antennas, sensors, and biomedical and nano-electronic systems and facilitate the design of novel devices. Conventional electric field probes have limited frequency range and sensitivity, often disturb the field being measured, and require laboratory calibrations that are inherently imprecise (because the reference field depends on the geometry of the source). Furthermore, linking these measurements to SI units, the highest level of calibration, is a complex process. 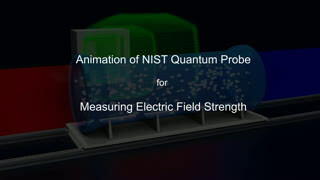 NIST's new electric-field probe spans enormous ranges. It can measure the strength of fields from 1 to 500 gigahertz, including the radio, microwave, millimeter-wave and sub-terahertz bands. It can measure fields up to 100 times weaker than conventional methods can (as weak as 0.8millivolts per meter, the SI unit of measure). Researchers used the new method to measure field strengths for a wide range of frequencies, and the results agreed with both numerical simulations and calculations. Importantly, the new method can calibrate itself, as well as other instruments, because it is based on predictable quantum properties: vibrations in atoms as they switch between energy levels. This self-calibration feature improves measurement precision and may make traceable calibrations possible in the millimeter and sub-terahertz bands of the spectrum for the first time. "The exciting aspect of this approach is that an atom is rich in the number of transitions that can be excited," NIST project leader Chris Holloway says. "This results in a broadband measurement probe covering a frequency range of 1 to 500 gigahertz and possibly up to 1 terahertz." The NIST instrument currently is tabletop sized, but researchers are working on miniaturizing it using photonic structures. The basic method has already been demonstrated for imaging applications. 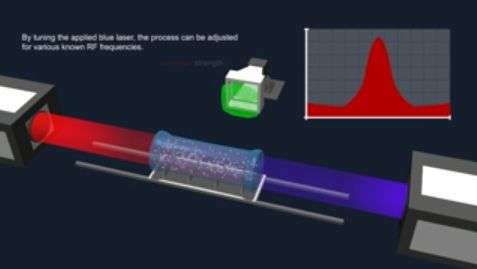 Briefly, researchers use a red and a blue laser to prepare atoms contained in a cylinder to high-energy ("Rydberg") states, which have novel properties such as extreme sensitivity and reactivity to electromagnetic fields. An antenna or other source generates an electric field, which, depending on its frequency, affects the spectrum of light absorbed by the atoms. By measuring this effect, researchers can calculate the field strength. Various atoms can be used—NIST uses rubidium or cesium—to measure field strength in different parts of the frequency spectrum. Among possible applications, the NIST probe may be suitable for measuring and optimizing compatibility in densely packaged electronics that include radar and wireless communications and control links, and for integration into endoscopic probes with medical applications such as investigating implants in the body. The technique might also be included in a future "NIST on a chip" offering multiple measurement methods and standards in a portable form. Importantly, the technique also enables, for the first time, calibrated measurements of frequencies above 100 GHZ, in the millimeter wave and sub-terahertz bands. This capability will be crucial for the development of advanced communications systems and climate change research, among other applications.